Keeping your property well-maintained can seem like a never-ending job and it can be overwhelming for even the most experienced homeowner. Keeping your gutters clean, your lawn is always looking it’s best, your house is painted and your timber fencing is moss-free, all take time and effort. However, keeping your home and property in the best condition possible doesn’t have to be so stressful. When armed with the right tools, techniques and methods, even the biggest jobs can become quick and easy. And, with everyone short on time nowadays, it’s important to ensure that these jobs are done as efficiently as possible. Continue reading for our complete guide on how you can keep your timber fencing free of moss so that it stays stronger for longer. Moss is a type of algae that likes to grow on wooden structures such as bases of trees, wood sheds, and residential fencing, especially in moist environments. This algae is made up of spores that attach themselves to your property and becomes a nuisance for homeowners. One effective way to remove moss from your property is with good old hard work and a little elbow grease. Soap and water are very effective at eliminating moss that has attached itself to your timber or steel fencing. It may take some time, but when you are finished, it will look like new. If soap and water are not cutting it, the next best option is to add in a little vinegar to remove the moss from your home’s fencing. Vinegar is alkaline and will kill the algae slowly. It’s important to make sure you dilute the vinegar and then spray the mixture directly onto the moss. Let it soak for a good twenty minutes or so before scrubbing it off with a solid brush. Once you have scrubbed it off, make sure to rinse the area thoroughly. After it dries, there should be no signs of any remaining moss. Whether you have a wooden fence or steel fencing, if soap and water, as well as vinegar, has not worked to remove your stubborn moss, then try some heavy-duty cleansers. There are a few different types on the market and it’s crucial you choose one that is safe for any vegetation and pets that might be in the immediate area. Make sure to use this method only as needed when other methods have failed, and discuss with your local hardware store what product is the best product currently available. The last way to try to remove stubborn moss, mould, or mildew from your residential fencing is to pressure wash the wood. This method works for both wooden and steel fencing. Make sure your pressure washer is set correctly because if you use too much pressure, you could strip the wood and damage it. Always test the material first in an inconspicuous area to make sure your pressure setting is correct. Then power wash it until all the algae have been removed. Why Should I Perform Maintenance on my Fence? Performing regular upkeep on your wooden fence is critical to ensuring it remains strong, healthy and attractive. 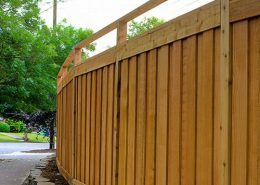 Without some maintenance your timber fence could fall apart and you might find yourself having to install new fencing, which can be expensive and time-consuming. With a little time and elbow grease, you can keep moss off your wooden fence by using soap and water, vinegar, special cleansers or simply power wash the moss away. Follow our suggestions and you will be able to keep your fence strong and healthy, avoiding any unnecessary costs going forward. Are you thinking of putting in a new residential fence on your property? 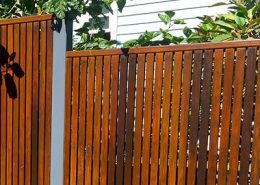 Today we will break down the most important rules when building a new residential fence in Sydney and provide you with resources to make the planning process easier. Privacy screens are becoming extremely popular. They provide a range of designs and can be particularly useful, being both property assets and providing solutions to local situations and environmental issues. Spending time outside is a great way for kids to learn and grow, and because kids are naturally curious and active, they need lots of space for running and exploring around – this is why your yard the perfect place for endless playtime. In today’s article, we share yard childproofing secrets to keep kids safe.